One high-ranking Artist from the Hard Rock and/or Metal Channels will receive 52 sets of guitar strings, 12 bass strings and additional goods. 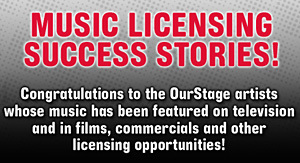 One high-ranking artist across the Hard Rock and/or Metal Channels will be selected by Ernie Ball and in conjunction with the OurStage editorial team. Visit www.ourstage.com/go/ernieball for more info. Win a performance slot in JetBlue's new Terminal 5 at JFK and also at the Bowery Presents’ Terminal 5 venue in New York City.